Brothers Moon in Hopewell (and check out their seasonal asparagus dishes). Tre Piani in Forrestal Village is open Noon-6:00pm, a la carte with special additions. Chauncy Conference Center in a beautiful setting in Princeton. The Frog and The Peach in New Brunswick. While you’re there, check out the new menu, which includes a 3-course Frugal Farmer prix-fixe dinner for $29. The Greens Restaurant at the Cream Ridge Golf course (there’s a Thursday night buffet, too). And – this one really tugs at my half-Italian heartstrings – The Baldassari Regency in Trenton – can you say Italian? 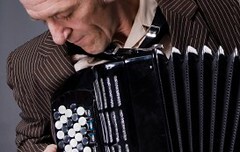 Call 609-392-1280 for details, which include an accordionist at brunch (Pasquale Diorio’, pictured here). Plus, nonnas get 50% off – so bring your grandmother too!